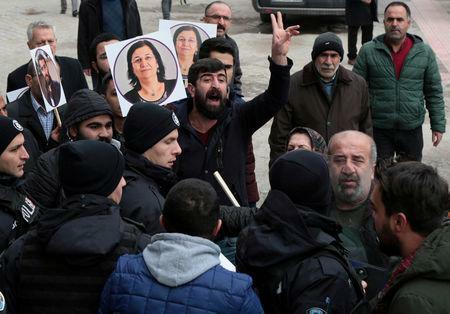 DIYARBAKIR, Turkey (Reuters) - A Turkish court on Friday released a Kurdish lawmaker who was jailed last year for criticising Ankara's military operation in Syria and has been on hunger strike for nearly three months. 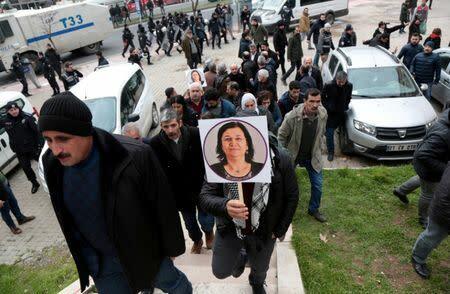 Leyla Guven still faces trial and up to 31 years' jail over charges of terrorism leadership and propaganda for her opposition to Turkey's incursion into northwest Syria's Afrin region. The judge in the largely Kurdish city of Diyarbakir released Guven as she had already been in custody for a year. Her health has deteriorated during a 79-day hunger strike to protest against the prison isolation of Kurdish militant leader Abdullah Ocalan, those close to her say. "This is a bittersweet joy for us," Guven's daughter, Sabiha Temizkan, told Reuters, saying her mother would continue her hunger strike despite her release. "I hope her demand will be met and her hunger strike will be finished before it does damage to her," Temizkan said. Guven, wearing a surgical mask, made a victory sign from inside an ambulance after her release. She has been consuming water with sugar, salt and vitamins. The pro-Kurdish Peoples' Democratic Party (HDP), says 250 inmates and politicians have joined the hunger strike. Guven was among some 600 people detained over social media posts and protests criticising Turkey's operation last year into Afrin where it pushed out the U.S.-backed Kurdish YPG, viewed by Ankara as a terrorist group. Last June, Guven was elected to parliament as a HDP member while in detention. Ten former HDP parliamentarians detained are still in prison. Guven is also co-leader of the Democratic Society Congress (DTK), an umbrella group of civil society organisations based in Diyarbakir. Jailed militant Ocalan is head of the Kurdistan Workers Party (PKK), which has fought an insurgency in southeast Turkey since 1984 and is designated a terrorist group by Turkey, the United States and European Union.